You can never have too many serving trays! They are invaluable when you entertain. They are used to hold everything from crudités and hors d’ oeuvres, to entrees and desserts. Trays can be made of many materials including glass, metal, wood or ceramics. What you are planning to serve on the tray should determine the type of tray best suited to use. Tiered trays are great for serving desserts or fruit, wood is great for breads or cheese and glass and ceramic are fabulous for anything messy as they can be washed easily. Trays are also commonly used as a decorative element. Place a tray on a coffee table or ottoman for a designer look. Display a charger or tray on a stand on your buffet to enhance the look of your décor. Trays are also a wonderful hostess gift. 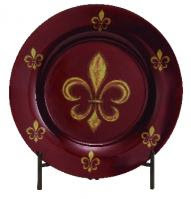 Check out the large selection of trays available at http://www.cheapchicdecor.com/.